Whenever you see a popular rand like Coke, Apple, Nokia and others, it is easy to recognize a popular brand whenever you see it. The Apple logo, you know is not a fruit but a gadget that is a real trendsetter. Apple as a brand did not gain popularity overnight - the brand identity of Apple was carefully and consistently crafted throughout the time. Graphic Designing is a creative and methodical plan to achieve certain objective with the use of symbols, words or images. It is a visual communication between your brand and the customer expressing the ideas and concepts using different graphic tools and elements. Logo is your brand identity. You would like your designer to design a logo that communicates who you are and the value of your brand, the logo should be simple, clean, uncluttered and visually appealing, It should also be classic and not go out of style within few months, your logo should be as per the industry standards and have the ability to make a lasting impression on the audience. You need to stock up Business Cards, as it is sort of business development. Any well designed card gives you an opportunity to reinforce a positive opinion of yourself and your brand in the eyes of potential customers. When it comes to designing a business card, you should keep it simple and uncluttered, your personal details on one side and your company logo on the other side. It is very tricky to design a letterhead for a company because letterheads cannot be showy. The logo on the letterhead should be visually striking with bold colors and texts, making it look professional. While designing envelopes, you need to add the company name, logo, return address and maybe a tagline. A well designed envelope has the potential to ensure clients notice your company name or logo. Banners are billboards and advertisements with a lot of engagement. Potential customers would like to engage with your brand or business. While designing banners you need to create an interest among your customers with illustration and images. Banner is a sales and marketing tool that attracts customers towards your brand. A good Graphic design can make your brand or business look good.If you want a good Graphic Design, We provide very impressive Graphic Designing Services for your Website and Your Business. 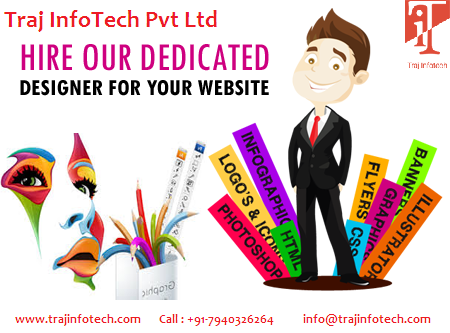 To Know more Graphics Design visit our Website @ TrajInfoTech Pvt Ltd an IT Service Provider Company in Ahmedabad.